BBC - Sally the Witch - what, why, how? Sally the Witch - what, why, how? The story of Sally the Dunstable Witch and the Bottled Curse has been around since the late 19th century, when a poem was written about her. And many residents remember being told not to hang around near the graveyard of the Priory Church of St Peter after dark. But why? Who was she and what is she supposed to have done that was so bad? According to the poem, Sally lived about 600 years ago in the early days of the Augustine Priory. To start with, she was just a typical elderly lady. She was quite harmless and just told fortunes, or would have a little potion to help you, or give you advice about your love life. But as she got older things began to change. She got a black cat that apparently taught her the black arts which she used against anyone who crossed her, so that things like sickness and mysterious fires were all blamed on the witch. Eventually people got really worried and went to the Prior calling for Sally to be tried for witchcraft. He was eventually forced to bow to public opinion and at the trial she was found guilty and sentenced to be burned alive. But Sally did not go quietly. At the stake she cursed loudly and threatened revenge on those who had condemned her. And she did exactly as she said, she came back and she was worse! After her death she terrorised the town and the Priory, everybody was scared of her. A palmer was called to exorcise Sally's ghost, but the witch would still not go quietly. The palmer backed her into a corner and suddenly as she shrank away he got her into a bottle and put a cork on it. They buried the bottle and put a cairn of stones over it so they'd all know where it was, because the palmer said that if the bottle was disturbed and she was let out, she would be even worse. So, it is said that a bottle is buried somewhere in the Priory gardens, which houses the spirit of this witch. For years, children have been told that they mustn't hang around in that part of Dunstable at night and if they were naughty, they were told that Sally the witch was watching them. But the bottle - wherever it is - mustn't be disturbed, or the spirit of Sally will haunt Dunstable again. This is a fantastic story in more ways than one, because it is, in fact, all made up! Or so we think! But, fictional as she is, the story surrounding her creation is just as interesting. A poem about her was written in 1875 but the ballad appears to have been forgotten until 1932 then lost and found again in 2002. Don't go near the graveyard after dark! On this occasion it was discovered quite by accident, by Rita Swift, a member of the local history society, who was in the library looking through old editions of the Dunstable Borough Gazette. "I was researching some other work down in the Library and got to the end of what I was doing and I just pressed the button on the machine and then stopped it" she explained. "It stopped where it mentioned a few things about the Dunstable Witch and a poem. I took a photocopy and took it home and read it and rather liked it. So I started asking around to see if anybody had got this poem. I contacted everybody I could think of but there were no copies around, so I thought that was the end of it. "Then I just happened to mention it to somebody one day and they said I've got a copy of it. So I read it and thought why was it written?" Charmed by the poem, Rita dug around further and eventually discovered its origin, finding out exactly why it was written. 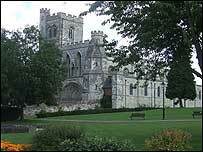 It stemmed from the fact that the rector of Dunstable at the time, Reverend Frederick Hose, didn't want to do anything about the Priory Churchyard which had fallen into disrepair. The poem, through the story of Sally, gives a reason for why this might have been allowed to happen. "The Churchyard was in a terrible state and the Reverend Hose only wanted to spend money on the church, not on the churchyard, and everyone was getting fed up with it" said Rita. "The local headmaster, A.P.Wire, said he would do something about it, but everyone said not to because the Rector was very vindictive. "Wire thought that the only thing to do was to shame the rector into doing something with the churchyard, so he made up this witch called Sally, all 81 verses of her." It was published by printer W J Smith, with Wire's name on it so there wouldn't be any comeback on Smith. It was published free of charge and sold for sixpence. "It soon became very popular and all the local lads got hold of it and started quoting verses to the rector who was furious" revealed Rita. "The bottom line was that Mr Wire had to resign from being headmaster and had to leave town, and the printer went bankrupt. Now was that coincidence?" So, Sally was created in order to shame the rector of Dunstable into repairing the Priory Churchyard - and it worked! 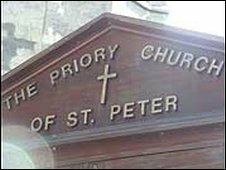 The poem drew attention to the Priory Church Restoration fund and a two-day bazaar was held which raised more than the £1,000 that was needed and a few years later the churchyard was finally restored. But even though, this witch supposedly never existed, she seems to be having a far reaching effect on at least one resident! "She haunted me" Rita continued, "because every time I thought I'd come to an end, she would turn up again in the most unexpected place! "In the U3A we had a lady from the Luton Museum come to give a talk. She said that they had a copy [of the poem] in the Luton Museum. I went there and there was the original copy plus a notebook which had been brought in an auction in Leytonstone. "This cleared up a problem. The poem was written in 1875 but the preface is dated 1899 and the notebook gave a clue. What Wire was obviously doing was putting his papers in order and writing the preface to go at the beginning of this notebook. "I'm sure Sally was waiting for me to find her!" After Rita found the poem, a photocopy was given to all the members of the Council. They were unanimous in that it had to be republished. And it was, just in time for the opening of the Priory House Heritage Centre. So the story of Sally the Witch lives on in Dunstable, even if she never did! And if the churchyard ever looks over grown again - remember the words of AP Wire, which may just give you a clue to the reason! Not to free the bottled curse."